I recently bought this Simple Kind To Skin Moisturising Face Wash as I ran out of my Witch Gentle Exfoliating Face Wash. I have heard lots mixed opinions on Simple as a brand, so I thought I'd give them ago for myself. The banner across the top of the product stating 'UK's No.1 - with multi-vitamins', enticed me to make a purchase. The product is very easy to use, which is brilliant when washing your face on them early or lazy mornings! The pearly colour of the liquid is very appealing and fresh looking. When foaming upon your face, there aren't too many bubbles, which I like. Once rinsed off with water, your skin is left feeling fresh and clean as no residue is left behind. The product contains no perfume, colour or harsh chemicals which gives the product it's 'Kind To Skin' name. 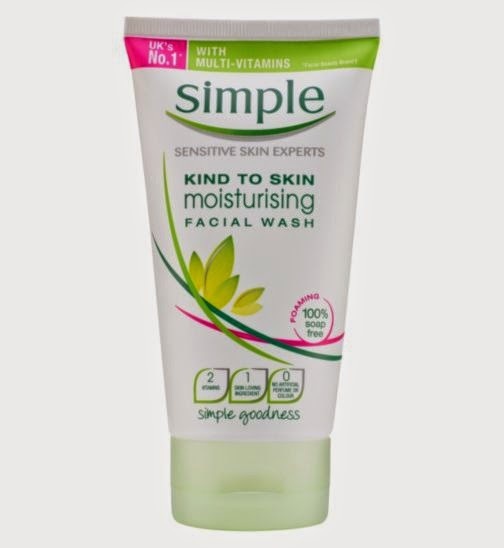 The face wash also claims to contain pro-vitamin B5 and vitamin E, which is a lovely bonus! Overall this is a great buy for a drugstore face wash, at the cheap price of £3.75. Simple is definitely one of my favourite drugstore skincare brands. Super affordable and the quality is super amazing as well! I haven't tried this facial wash yet. I should soon though.